Ever since I saw La Blogothèque’s Take Away Show of Foxygen’s “On Blue Mountain”, I have been waiting for my chance to see the band live, and my chance came this past week at the Jefferson Theater in Charlottesville, VA. The shirtless Sam France (lead singer), known for his manic behaviors on stage, gave a show complete with bizarre dance moves, sweaty sporadic body spasms, and repeated collapses to the stage floor. Three background singers/dancers stood alongside France, dancing together in semi-unison. The other band members were simply engulfed in their instruments, almost unaware of the crowd that was jumping along to their music. There was passion alive on that stage and the audience certainly felt it alongside the band. There wasn’t any theatrical plan for the show and it made it feel very genuine to the music. Many bands these days feel obligated to put on a dynamic show, and Foxygen sticks to their music and the improvised performance that seemed to happen along with it. 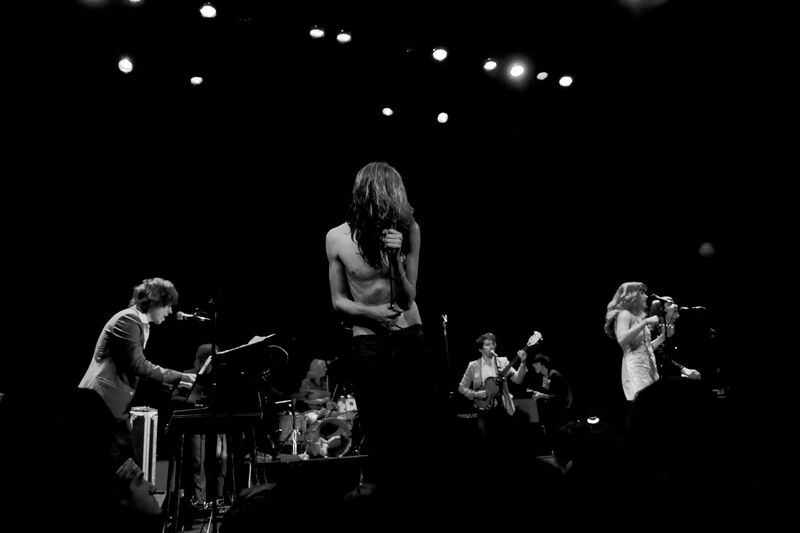 Foxygen’s live show is not one that you should go to expecting to sing along to every song; France’s vocals were often characterized by spontaneous screaming and mumbling, reinforcing the improvised nature of the concert. This aspect threw many concertgoers off a little bit, as they seemed eager to mouth the words alongside France, but everyone quickly settled into the nature of the performance. A guy next to me captured what I think a lot of people were feeling: “I had never heard of Foxygen before tonight, and, man, they’re my new favorite band.” Foxygen takes it back to the roots and transports their audience to what I would imagine a 60s psychedelic rock show would be like. The band offers an escape from the real world to a place where it’s all about the music. Their third record …And Star Power drops tomorrow October 14th by Jagjaguwar.